I thought that today’s blog post was just going to be about polishing up silverware and that I would be able to share a straightforward set of tips on how to bring your old teapot back to life. However, while I was polishing my pots, I turned them over and found a name stamped into the base – Picquot Ware. I was intrigued and after buffing up my DIY polishing project I headed indoors to investigate. My husband found these kitchenalia items at a recent carboot sale and I loved the shape as soon as I saw them. I adored the curvy design and I imagined it to be the kind of tea set that might have been used to serve passengers on the Titanic or on a Mallard steam train journey in the 1940s. I’ve since researched the range online and have seen the Picquot Ware set described as 1940s, 50s and 60s, so I can’t be sure exactly how old my tea set is but I’m delighted that it will be another addition to my mid-century modern collection. From my research I found out that the 40s items of this design were marked “Newmaid” and were later stamped with Picquot Ware in the 50s and 60s. My pots all have Picquot Ware on the base along with a Made in England stamp so we’re look at a manufacturing date of 1950s onwards for my set. This jug was apparently used as a water pitcher or coffee pot rather than a tea pot (a traditional shape teapot is available within the same range) so I’d say that my tea set is actually more of a ‘coffee set’ if there’s such a thing! I’d love to find the teapot to match and turn it into a proper tea set, although judging by the stains on the inside of my coffee pitcher, it has been used for tea in the past. I actually saw a Picquot Ware hob kettle online but it was selling for around £100 so I don’t think I’ll be getting my hands on one anytime soon, unless I happen to stumble upon it at a carboot sale! From my research I have discovered that the full sets are very pricey – with full range of teapots, trays, kettles and jugs available – but individually they are worth around £20 each. The coffee pot is made of “Magnailium”, an alloy of manganese and aluminium that was especially developed for the Picquot Ware range. The pot is cast in one piece to minimise leaks when pouring and even the spout was designed to be ‘non-drip’ so this must have been a key feature of the product at the time. Perhaps the ‘modern housewife’ didn’t need the hassle of washing drip stains out of the tablecloth when there was a war to fight and country to rebuild? Even though many similar products were being produced with plastic handles at the time, this coffee pot was manufactured with a sycamore wood handle. The designers of Picquot Ware believed that that no plastic could imitate the grain of real wood so they stuck with a traditional material for the handle. It’s a really chunky solid pot and it is about 7 1/4 inches high. The accompanying sugar bowl and milk jug are just as chunky, with a good thickness to the walls of the items, although they are nowhere near as thick and heavy as the pot. Clean them thoroughly with hot, soapy water. This won’t damage them as they’ve probably been washed hundreds of times over the years of use! Dry them thoroughly with an old tea towel. It’s possible that some of the residual dirt will rub off onto your towel so be prepared for this. Using a cloth, apply a small amount of metal polish to the item. I picked up this tube of metal polish from the pound shop. Wipe away and admire the smooth shiny surface while being shocked at just how mucky your polishing cloth now is! Wash again in hot, soapy water before using it for any drinks. It took a lot of polishing to bring my Picquot Ware back to a sparkling shine but I actually enjoyed the process. It was really satisfying to remove all the build up of grime that had accumulated over decades. Okay, they won’t ever be showroom perfect after years of use but I’m pretty chuffed with how the tea set now looks. Have you too ever bought something that you later found out was a vintage piece or retro classic? Did you worry about using it more after you researched it and found out that it was particularly old or valuable? Let me know what you think of my new tea set and whether I should actually use it or just keep it safe and pretty in my teak sideboard. Leave me a comment below or tweet me @Cassiefairy. Wow, such amazing memories of the Picquot Ware factory and company – it’s interesting to hear from someone who was there 🙂 Thanks Ian! My Mum foresaw the financial issues that befell the company and tried to warn Mr Burrage before they invested heavily in a new plant in Round Spinney. It was difficult for the skilled workers who lived near the old factory in and around Adnitt Road to get out to Round Spinney Ind Estate, which was right on the outskirts of the town – not everyone had cars and the where-with-all to get there, or get home again, for their shifts – bus routes were not the best at that time. Also, the new foundry at Round Spinney was a huge investment which was taking them in a different direction to their core products, with their main market for sales of Piquotware being Japan. Such a shame to see it close.. and damn those ****ing bankers who put many onto the dole by pulling the rug from under the company way before they needed to – it wasn’t like it was well into the red at that point and the bank reneged on the loan very early into the heavy capital investment, with no way for the company to find new avenues of funding in the short time they were given to repay the loan. My Mum never fully recovered from losing her job there, and coming a year after my Dad had passed away as well, Mum never truly settled in any of the jobs she got. Ironically, I joined the Fire Brigade in 1987 and got to see the aftermath of the fire at the factory. On chatting with some of the guys who attended that night, they wished I could have been there too because of my knowledge of the factory, including the very real hazards to the Firefighters – all the old wooden floors in many parts of the factory and in the cellar areas had had years of machine oils and cleaning-process solvents soaked into them, so they contributed significantly to the intensity of the fire, threatening the stability of the structure, which when part of it did collapse, it nearly took out a Hydraulic Platform with several crew members in the cage operating the water monitor. Wow… this has brought back a lot of memories. 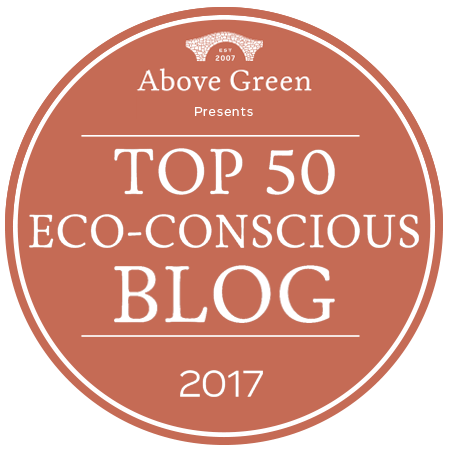 So thank you for the blogpost. I’m fairly new to being an owner of Picqout Ware although I’ve known about it for many years and finally took the plunge and bought TWO sets on eBay!! It seems, though I didn’t realise it at the time, I have bought one Aladdin style set complete with tray and the other set I would assume is a later straight sided style selling as ‘Art Deco Style. I had actually bought the ‘Aladdin’ style set only for the tray which I like much better than the later styled one with two square handles each side. I figured I had made a good deal since I had previously found only a tray being sold for £70!! I paid a little under €60 for a 5 piece set!! One set is highly polished and relatively clean inside the teapot and hot water jug (nope – we Brits never called it a coffee pot!!) but the Aladdin set needs some TLC. I read that regular washing machine powder will do the trick but wonder if a couple of Steradent tablets would also suffice? The teapot must once have been owned by a smoker and I’d like to get both inside and outside ‘clean’ and smell free before using it! I’m very late to this blog, but have a number of Picquo Ware teapots, water jugs, sugar bowls etc. I have just found a teapot and water jug that look exactly like Picquot Ware, but the underneath does not have the usual stamping – and each one only carries a stamped letter “R” underneath – Does anyone have any ideas ? Carefully pry the caps off that you can see in the holes in the handle. I used a very small flat screwdriver to do it. You will then see a screw underneath. When putting it back together make sure you use a washer AND a spring washer and DON’T overtighten it. Unused? Boxed? Still with the original documents? What you might get for these depends on where you advertise and who gets to see the advertising. I couldn’t even guess how much you might be able to sell them for. I’m almost tempted to make an offer myself. The delivery costs though would be quite high, even within the UK. Thank you so much for all this helpful maintenance information! I have a set in beautiful condition that was given to my parents as a wedding gift in 1955. I’ve loved this set since I was a little girl and would admire it on my parents’ table during holidays and special meals. Mom and Dad recently gave it to my husband and I as a housewarming gift. Unfortunately, soon after a party, the creamer was mistakenly run through the dishwasher and the detergent damaged the finish. I was heartbroken! After careful cleaning with metal polish (Noxon) and a soft cloth, I’ve been able to restore the creamer’s finish to match the rest of the set. Thanks so much! Washing powder apparently does the trick. Someone suggested using a Brillo pad but I wouldn’t. Personally I think that the patina inside a well-used teapot does no harm and even adds to the flavour of a cuppa but I know not everyone feels the same. I missed the tip for cleaning the inside of the teapot . Could it be written up again. I have tried vinegar and boiling water and I have also tried bicarbonate of soda. Not peffect but getting there . Anything else? I don’t know of anything that would “etch into” an aluminium alloy, although I suppose long contact with anything acidic might do it. You should be able to remove any marks on the exterior by using Duraglit. Try it on a small area first, of course (the usual advice). The 4cup teapot and its jug, inherited from my mother-in-law, has got some white encrustations on. It was ‘put away’ in a basket, and I think these may be where it was resting against the bottom or some old tissue paper. I have washed it with warm soapy water and rubbed gently, but though the white crust has come off, it has left marks….that look and feel quite etched in and permanent. Any ideas out there? Shouldl I try duraglit or metal polish….or…? I have the piquot kettle which I chose when I bought my AGA cooker in 1980, Both have been in daily use since and are still going strong. came across this site when looking for factory details for a replacement handle after purchaing a replacement some 15 years ago. I’m really sorry to hear it is now no longer in business. My Mother-in-law bought me the matching teapot in 1980 and that is still in regular use. These beautiful items were certainly made to last! Ooh good question Eleanor, I have no idea if Picquot Ware would work on an induction hob – I only have gas in my home. Does anyone else have an induction hob? I just purchased this tea set at an antique fair in Hobart, Tasmania (Australia). I’d never heard of Picquot Ware, however as soon as I saw this I had to have it. I was ‘Googling’ how to ploush it when I came upon your blog. Thanks for the interesting information and cleaning instructions on Picquot Ware. Such interesting information, thanks for sharing it Hayton 🙂 I agree, it does seem like the mis-spelling was deliberate to indicate that ‘something else’ – a special ingredient – was included in the mix. I apologise for the long delay in posting a reply to your question, but I thought I might be able to find out some more about the production process. I wasn’t able to discover anything more than I knew already, most of which came from my father and from personal observation many years ago. The details of the metal alloy must have been a closely-guarded secret, because I suspect that there was more to the alloy than just aluminium and manganese (“A metal with important industrial metal alloy uses, particularly in stainless steels”). From Wikipedia : “The second largest application for manganese is in aluminum alloys. Aluminium with roughly 1.5% manganese has increased resistance to corrosion through grains that absorb impurities which would lead to galvanic corrosion”. So it appears that the main extra constituent was indeed manganese. However, a metallurgist did one or two cursory experiments and concluded that there must have been an extra metal included in the alloy since the results he obtained were not what he expected to get from an aluminium-and-manganese alloy. Annoyingly, he dropped the subject and did not follow up with any suggestions as to what the extra element might have been. If Burrage and Boyd used the mis-spelt name “magnailium” instead of “magnalium” (the proper name for an alloy of aluminium and manganese) this may have been done deliberately, to indicate that something else was included in the mix. And we know (it’s posted here and is also in most of the product descriptions) that magnailium was an alloy developed especially for the Picquot Ware range. So, its precise composition would perhaps have been a trade secret. Buyers weren’t too concerned about the production details, after all, they just liked what they saw (and still do). Came across your website today when I was looking for some cleaning tips for my Picquot ware teapot etc. I was given mine as a wedding present forty years ago in the 1970s . My mother has had her set a lot longer. They were regarded as a “must have” item back then. Mine sit on a tray ,also Picquot ware, very much made to last! Thanks for all the cleaning tips folks, both inside and out! Thanks for sharing your story Steve, so interesting to read your comment 🙂 That’s a great tip for cleaning the inside of the teapots, I know a lot of people struggle with cleaning the insides after years of use. I haven’t tried this technique yet, thanks for your advice! I was very surprised to stumble across this Website. Back in the early 70’s, when first married, we rented a house in Adnitt Road, Northampton and shortly started working evenings for Burrage and Boyds who were situated just about 50 yards up the road. Our tasks included turning the insides of the teapots and jugs, linishing sugar bowl lids and various other jobs. Unfortunately, after 12 months or so, I had to move away with my main job but we had managed to save up enough money for a deposit on our own house! As staff, we were able to buy ‘seconds’ of various items which were put into daily use and got well knocked around over the years. Recently, at a car boot sale, I found a teapot, water jug, sugar bowl and medium tray – all for £4.00. and we are about to restore it. The metal polish (Solvol Autosol) has almost doubled the cost of my investment. One tip, picked up years ago, for cleaning the inside of teapots is to half fill it with water, add ordinary washing powder and boil it on a gas ring! taking great care not to get the handle near the flame. We have not tried this on an electric hob so beware! A few years ago, at an antique fair, a dealer had a very highly polished set on a tray. When I asked why she was asking such an exorbitant price for them she swore blind they were Silver! I always do! Keep up the excellent work! I love my Picquot Ware Kettle, just one problem it is so quiet when it is heating and comes to the boil, a steady stream of steam is the only clue to the fact that the water is boiling. So I bought a “boil alert” disc. For just a few pounds I have solved the problem. Now there is less chance of it boiling dry or the water boiling for too long. So glad I found your page. My parents received a Picot ware teapot as a wedding present in 1952 which I always loved as a child because of its lovely wooden handle and unusual shape. I recently saw a hot water jug, sugar bowl and milk jug on EBay so just had to have them, I had no idea other pieces were available. I love using them now as they are so unusual and I always get loads of comments….and it’s a wonderful way to remember my parents, every time I pour a cup of tea. Long live Picot Ware! I used a Brillo pad on the inside of my teapot, it took a little work but it came out as clean as new. Anton – to clean the inside of a picquot ware teapot put a dishwasher tablet in and leave to soak overnight. I learned this tip off my Mum she’s had one for 45 years which she inherited from her grandmother and mine was inherited from my grandmother 20 years ago. They are both in regular use and therefore this tip has been well tested. “I was poking the strainer holes which were blocked and rusty and then the strainer disintegrated. Hello, It’s so nice to meet another Piquot-ware addict. I bought my first item (the kettle) in 1955 or 6, later adding the teapot, jug & lidded sugar bowl unfortunately in one of my many moves the jug & sugar bowl have been lost. However, my teapot is in regular use and the kettle sits at the end of my Rayburn. The teapot keeps beautifully shiny with a wash and a polish with an E-Cloth for stainless steel, it works very well. Th kettle is in pretty bad shape, in serious need of TLC which is why I was so pleased to find your site, I now know what to do to bring it back to life. Here’s a little tip about polishing Picquot Wear, especially those little areas that are difficult to get at. My arthritic hands ran out of strength before I’d managed to get my pots really shiny. Some water marked areas were proving very stubborn. I gave it a lot of thought. I have always kept old tooth brushes and even now that I have an electric tooth brush I keep the old brushes …even though I’ve not really found them useful. Now a little metal polish on a well used soft brush head on the electric handle and the job was done successfully! I’m delighted. From what I’ve heard from all the Picquot Ware collectors, they are certainly the best non-drip teapots around! Polishing with a tea towel after every use is a great idea 🙂 Amazing that you have one of the smaller teapots – that must be quite a rare find! I bought a Picquot Ware set off ebay after seeing a set as one of the items on Bargain Hunt. I loved the form of them and needed a better teapot. I have ignored the collectability of this range and had them in active service for over three years. The teapot is the best I have ever owned, used daily and never drips (why do teapots made 60 years later drip)? The sugar bowl i have is also a fantastic design. I like the set so much I have bought a second set for my mother and lobbed her old teapot in the bin! I will have a go at cleaning my set as you described. Have you cleaned the inside of the teapot as mine is rather grubby and the metal didn’t seem to like the bleach I tried in it? I Remember being with my mother when she bought her Picquot Wear tea pot, hot water jug, sugar bowl and milk jug in 1969. The man said that they would last a life time. When my mum died in 1980 I foolishly let the tea pot and hot water jug go. My aunt took the milk jug and sugar bowl. She had the small size tea pot and water jug. When she died in 1991 I kept them all. Then I bought a new tea pot on eBay, then another small teapot. At the time ( early 2000’s) you could still have them refurbished in Scotland, it was costly but oh so worth it. I chatted with the boss who said he had tried to persuade the workers to start up a refurbishing company on their own, but they were not keen. He also told me that I was lucky to have two of the smaller teapots as the mould had been broken and there would be no more of them. So I have one perfect set and one that needs polishing. My advice is once it’s clean and shiny polish it with a tea towel after every use both inside and out. Never leave them wet or even damp. I read about using Coke Cola to clean stainless steal so I tried using it insid the pots. It was helpful inside the water pot but did little for the tea pot. Lately I bought another set on ebay all I wanted was the tray, my friend was happy to have the tea set. I must stop buying! But I’d love a kettle. Re the handles. So far I haven’t had to replace any but when the varnish wears out I use glass paper and carefully remove the remaining varnish then revarnish with a marine quality varnish. I think we should form an Afternoon Picquot Wear Tea Club! If any one wants to sell a kettle I’m in the market! I am concerned about the aluminum leaching into the hot tea also. I have used mine for years and love the tea out of it. Wow that’s great news Phillip, enjoy your Picquot Ware! were very useful. An you also told me about it as when I type in New Maid Teaware nothing came up on the net. Hello Peter, Thanks you for your lovely background information! It’d love have seen the process om making. I bought a water jug on my trip to scotland and absolutely fell in love with it. I’m trying to find out more about the alloy itself. On the care instructions leaflet it states that the pot is made out of ‘magnailium’, with two i’s. HoweverI can’t find any information about this alloy except when it comes to Picquet Ware itself. I can however find references to ‘Magnalium’ (with one i). Magnalium is made of aluminium with magnesium (chemical abbreviation: Mg). But the Picquot Ware is supposedly made of manganese (chemical abbreviation: Mn) and aluminium. Do you perhaps know which one it was: manganese or magnesium? Or maybe anyone else knows? Thanks in advance for any information. I just bought a teapot . Let me know if you are interested. If you are I will post a picture and the price. @Ken King – see my post of April 17th for design codes (eg T4, T6) and when changes were made. What that list needs though is a photo for each one so you can see how the look of the teapot and other items changed over time. Hi I have enjoyed reading comments. I have I presume my grandmothers Piquot T6 and J6, perhaps brought outfrom Scotland. We used to use the teapot but not for along time now. I also put them through the dishwasher due to mould spores. The timber handles have held up ok. The teapot handle had always had a crack and loose varnish. Just wondering since I read they are alumimium does anyone worry about using them now. I certainly prefer not too. My parents had (have) that set from new including the tea pot which is shorter and wider than the coffee pot. Looks like yours came up good after the cleaning. I have a vintage espresso machine to clean up so will need to go buy some polish. Hi Robyn, Ooh that’s exciting, I’d love to see a photo! My email address is cassie@cassiefairy.co.uk if you send it to me I can add it to the post 🙂 Thanks! Hi Cassie I have a coffee percolator and would like to post a photo for you if you would like to see one .they are quite rare .. what is the best way to do this . Cassie will know how you can get pictures to display here – if, that is, it’s allowed. I think you need to upload pictures to somewhere like Dropbox and then provide a link to the location, but it’s not something I’ve tried. Cassie? You might be very lucky and find some more handles but I doubt it. hi I’m looking for help my husband put my picquet tea set in dish washer now need to find out how to restore handles have taken a a bad hit will be able to polish up metal but not sure what to do about handles any ideas. Not many people will have seen one, because only 300 were made before production was discontinued (it was a “production nightmare”). Is there a way for you to post a picture of it here so we can all have a look at this rarity? which is very rare . I have never seen another one . I works well and makes great coffee . Okay, I don’t know what happened there but I can see the “missing” posts now. @Anne Vallata, I posted the news about Picquotware UK a few days ago but it seems to have vanished.along with another post about Picquot ware types. Possibly because both posts included URL links. Basically : the receivers moved in about 18 months ago. The renewed interest in Picquot Ware (and the increased business refurbishing them) came just too late. The latest info I have on the company says it is “Dissolved”. The poor man running it must have been devastated. If he’d been able to keep going a bit longer he would have picked up a lot of business from the resurgence of interest in all things Picquot-related. There used to be a Picquot website but now if you try to go to http://www.picquot.co.uk you are presented with a page advertising Adidas footware – the site appears to have been hacked, so don’t go there. – the K3 kettle was the first product to be designed, in 1938, but production was delayed until after the war (1946-47, as the “Newmaid”). in 1951 the name was changed to ‘Picquot Ware’ for marketing purposes. – the J6 hot water jug, the C6 cream jug, the S6 sugar bowl and the R6 serving tray also appeared in 1949. “1952 saw the introduction of the T4 range consisting of the T4 teapot, the C4 cream Jug and the S4 sugar bowl. Also in the 50’s the method of production was changed leading to a slightly modified T6 teapot. In 1960 The TB range consisting of the TB teapot, the CB hot water jug, the CB cream Jug and the SB sugar bowl was introduced. This eventually replaced the T6 range. 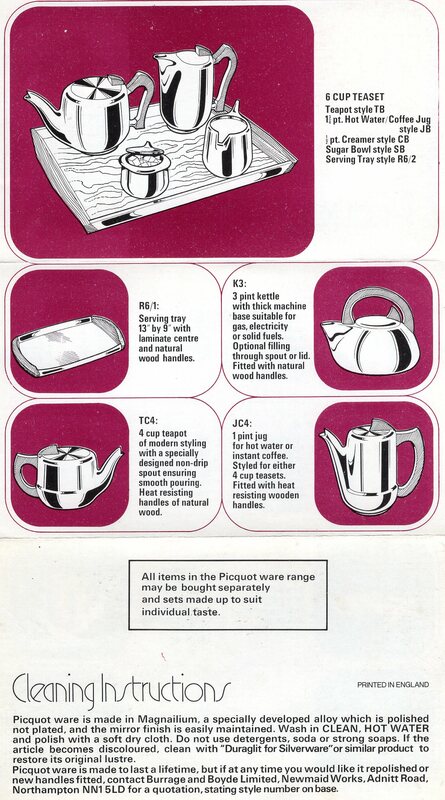 In 1962 a 4 cup teapot (TC4) and a 4 cup hot water jug (JC4) were added to the range. So everyone who thinks they’ve got a coffee jug has probably bought instead a water jug. Of course, knowing that there were differing styles of kettle, teapot et al isn’t much use without pictures of the different styles.In the absence of product catalogues – and I think you’re going to have to be very lucky to find one – the best bet is to scour the online sales of Picquot Ware, where the Type is often illustrated by a photograph. Assuming the Type has been accurately stated you could build up a collection of photos and upload them somewhere so that anyone interested can compare what they’ve got against the different photos. I’ve checked some of the likely places that might have had records from Burrage and Boyde, but have drawn a blank. There’s nothing in the Northamptonshire Archives, the obvious place to have received any company records, so it’s likely that when the company folded everything was either thrown out, or – if left behind in the offices – went up in smoke when the whole place burned to the ground in 1987. It’s possible that some Burrage & Boyde papers could still be in the possession of the Burrage family – the chairman, Mr. Burrage, was still alive in the 1970s although by then probably not very active. His sons were then running the business. It’s a pity I didn’t keep the material I collected from B & B in 1968-69 for some project I was doing for A-level Economics. I’m sure one of the things I had was a product catalogue. I don’t think I held on to any of it once A-levels were finished. I always wondered where the name came from, and the “official” explanation that Picquot Ware is so called because it was designed by one Jean Picquot some time in the 1930s just doesn’t stand up to scrutiny. If he ever existed he designed just these items and then faded into obscurity, a very unlikely fate. I’m afraid the explanation I found in a book entitled “Periodic Tales: The Curious Lives of the Elements” is quite possibly correct, although it debunks the myth completely. The name Picquot is a gennuine French name; if you look for ‘Jean Picquot’ on Facebook or LinkedIn you’ll probably turn up one or two. But the true designer remains mysterious and hidden and therefore (England being snobbish and class-bound well into the 20th century) quite possibly one of Burrage and Boyde’s employees. One of the people posting here who worked there or had a family member who worked there could be a descendant of the original humble – but talented – designer. A nice thought. You asked if I had any pictures of Picquot Ware : no,. or if I have the pictures are buried somewhere in the boxes that I haven’t unpacked yet. (I had a traumatic house move and the packing got rather chaotic. I’ve only just caught up with all the emails from a prolonged period offline). I have only two pieces of later Picquot Ware, both of them enamelled saucepans (never used). My brother is rumoured to have made off with a complete set when the house was cleared after my mother died, but no-one knows what if anything he took for safe-keeping. It’s in storage somewhere. My sisters have individual pieces, I’ll have to ask them if they can send photos. Thanks for the info- it seems so obvious now that you mention it but I am NOT an American but a mostly coffee drinking Canadian!! ( my tea drinking grannie has passed and she was my tea drinking buddy )and the giver of the picquot set. My two cousins and I rec’d our sets for our weddings. I will have to let them know about the interest in case they wish to sell their sets. But I’m keeping mine! I have been trying to get in touch with the company in Scotland who do refurbishing of the teapots but with no luck. Has anyone been able to contact them recently? Many thanks. I live in canada and recd a set of picquot ware- teapot/ coffee pot /sugar bowl and cream pitcher on a tray as a wedding present in 1975. I found your website because my husband put the creamer in the dishwasher and it is almost black! and I thought I’d let you know that it was being sold in the 70’s with very similar styling. I’ve always loved the more modern styling which still works today- although the coffee pot is fairly useless! Hope the cleaning works-thank-you. I’ve tried aswell Ken. I read on line that the Scottish picquotware distributor has bought the rights and the moulds to the range. I have e mailed the company in Scotland and am waiting for a reply. I’ll keep you all informed. Hi. I’m collecting Picquot ware and ive got a tip for cleaning the inside of your teapot. Use half a scoop of vanish in your stained pot. Add some boiling water, not too much, about 1 inch or so and let it fizz. Keep your eye on it because it forms quite a froth which can leak out of the spout and that will need wiping straight away or it will mark the mettle. Leave it for 30 mins or so and pour out. If you do mark the mettle, not all is lost. It will come off with Silva polish but it takes alot of elbow grease and a couple of attempts. Well Cassie,I’ve started collecting Picquot and have started cleaning and polishing. Some pieces need the handles removed,and for some it’s easy, just simple screws, but others dont show conventionalscrew heads, just plain brass discs where a screwhead is expected. Does anyone know what sort of fastener lies beneath ? Is it a drive-in spiral pin, for example ? And how can they be taken out without destroying the handle ? Can anyone offer advice please ? Cassie, I’ve admired the beautiful design, quality and precision manufacture of Picquot Ware for a long time and your post prompted me to do something about it. I have now purchased some scruffy items to practice on, and in due course I’d like to collect the full range of designs; buying cheaply (I’m pensioner with limited funds) and restoring them for display. I’ve looked in vain for a listing of the various designs and changes made over time. Do you or any readers know where I can obtain old catalogues or other such reference material ? I still have my original Newmaid set that I bought in the late ’60s or early 70’s in South Africa. It has been packed away for a few years so I was looking for cleaning tips. I seem to remember that we were told to wash with soap and hot water and not to polish it as it can scratch the surface. I am so surprised to see that it has become a collector’s item. We used to use it every day and it is not only attractive but does keep the tea hot longer and makes teatime a real pleasure. I may have to try some liquid polish to restore the high shine. Like yourself, I’m a professional writer…see bobthebook.com. Shortly after my wife and me married in 1972 we bought a Piquot kettle and teapot from a shop in Petersfield. We still have, and use them both. My morning mug of tea is always made made in the Piqot teapot…..great souvenir of a happy marriage. Do you know the name of the designer/s behind Picquot ware. My husband has started collecting picquot wear, says it will be a good inheritance for my son! We have a load in boxes in the attic now. We were lucky to get a hob kettle from eBay for about £50 so he is very pleased with this. We weren’t sure what to use to clean it all, but I will get some metal polish & have a go. I’m glad these things are still so highly thought of; my father spent his entire working life (apart from a break during the war, when he was doing something mysterious connected with Spitfire production and anti-aircraft rockets) making Picquot ware. He was the foreman at the small foundry Burrage & Boyde had in Northampton, and in the days before proper instrumentation was developed it was all down to his skill and mastery to decide when the molten metal was at the right temperature for casting into the moulds. I used to go into the works sometimes, and it was a noisy, fiery, dangerous working environment. And yet out of it came these beautiful things – solid, functional, yet also graceful. No-one who hasn’t seen the process can appreciate the amount of work that went into finishing, polishing and burnishing each individual item, by hand. It’s a shame they went out of fashion, and the company struggled to sell them in its final years; on the day my father retired, the company closed down. In place of the pension he had paid in for for so many years, they gave him the contents of the company petty cash tin. So to everyone who treasures these pieces of Picquot ware, spare a thought for the master craftsmen (there was a small team) who poured the molten metal for each one by hand, in working conditions which now would not be tolerated, and did it because they were proud of what they could do. Great tips! I need to take my picquot ware out of the closet. I feel inspired to clean and polish all the pieces and use them again! Thanks for sharing! I too am a huge fan of picquot ware. It has such style and the teapot, which I use every day, is the best pourer ever. There has never been a single drip. I have bought a few pieces from eBay and am trying to collect all of the different styles, I have got some really good prices. I love cleaning it and watching the shine gradually appearing. Hi Cassie. Thanks for the advice on cleaning the set (I’d googled for this and your blog came up) as I was rather stumped! I’ve just bought a teapot, coffee pot, milk and lidded sugar bowl for £65 from eBay……..oh, and a tray. I’d trawled the Internet for a few nights looking for Piqiot Ware for my father’s birthday….an unusual present, but his favourite teapot has ‘had it’ and he won’t give it up unless I produce something similar…….I may stuff the ubiquitous pair of socks in the parcel as well!! hi, i just found your info about picquot ware, i’m just starting to look for this set, as my mother had one for years, and the association just makes me think of home. after my mother died, most of the set went to ‘live’ at my oldest sister’s home, she’s quite the collector. i did, however, grab the sugar bowl, which is very different to yours. i decided to post here, because i wanted to advise you to check out the model of sugar bowl that i have. it’s by far the best design of sugar container that i’ve ever seen or tried, as it keeps sugar dry like no other one that i’ve seen, and is really simple to access sugar, too, as the lid that it has just flips up when you want it to. wendy.